1) Your Breeder should belong to a local Miniature Pinscher club or national club; Miniature Pinscher Club of America. A breeder belonging to a club learns more about his/her breed, general dog care, modern breeding practices and his/her breeding practices are held to the Breed Clubs Code of Ethics. 2) Your breeder should be involved in showing their dog(s). A breeder that also competes in AKC conformation provides competition, which encourages breeders to produce better dogs. A breeder that is active in dog shows want to prove how good his/her dogs are. A breeder cannot rely only on pedigree or papers to indicate the quality of their dogs. Even though you most likely do not want a show dog, you deserve a pet that is the result of a carefully planned litter. You want a pup that was brought into this world and given the same treatment and care as his or her potential champion littermates. 3) Your breeder should suggest and encourage you to take your puppy to your vet within 48-72 hours. This is to determine the pup’s state of health so that you are both assured that your new puppy is healthy and ready to start his new life with you. If a problem should arise your breeder will quickly work with you to resolve that problem. 5) A reputable breeder striving to only produce healthy puppies will provide you with proof that the parents of your puppy have been tested and proven free of all genetic defects. If this is not offered to you ASK for it! If you don’t understand what you are seeing ask questions. The breeder will gladly discuss what the tests are for and explain the results that you are seeing. If the breeder can not show you proof of health testing for at the very least eyes and knees, then I strongly advise you to look elsewhere for your puppy. You want to know about the results of the CERF and OFA on at least the parents of the puppies you are looking at, if possible knowing this information on at least the first three generations is even more beneficial. This could mean all the difference in the world between having a healthy dog for many, many years or having a dog inflicted with any number of health problems which can prematurely end the life of your dog or require you to spend thousands of dollars in vet bills including medications and surgeries. 6) A breeder that you should be working with will make it clear to you that his/her responsibility for your pup continues long after you have taken your pup home. A responsible breeder will request that if for any reason the pup cannot continue to live with you that he/she is returned to the breeder or only re-homed with the breeder’s approval of the new home. You will be required to sign a contract stating that you agree to this. 7) Expect a breeder to ask many questions about you, your home, your current pets, past pets and what happened to them. Your breeder will ask if you have a fenced in yard or if the pup will be walked on a leash. Your breeder will naturally express the joys of owning a Min Pin but he/she should also cover with you the negative aspects of owning a Min Pin. The breeder will want to know that this pup is going to a home that he or she will be in for the rest of his/her life. A good breeder will want to feel secure in placing this pup with you and know that a Min Pin is the breed for you. 8) Your breeder’s dogs should be kept in a clean environment and he/she should show you well-socialized puppies that are healthy, alert, have clear eyes, clear noses, and bright coats. The dam should have a good temperament, look happy and self-assured. She should not cower or act aggressive in any way or appear frightened. The puppies should be raised within the breeder’s home and around everyday activities so a TV or a vacuum cleaner and other household activities do not frighten them. The puppies should not act shy or scared. The puppy should readily greet you in a friendly and playful manner. 9) The breeder should willingly give you references. This would be the name of people who have purchased puppies from them in the past. Their vet and perhaps other members of their breed club. Don’t feel offended if a breeder seems a bit hesitant to sell you a pup until they get to know you a bit better. The breeder may encourage you to visit often before choosing your puppy or even suggest that you wait for another litter before you make your finale selection. The breeder will also ask you for references, be prepared and have them ready. This would include first and foremost your Landlord if you rent, your vet, members of everyone in your household, breeders and rescue groups you may have worked with. Don’t be surprised if your breeder asks you if you have considered adopting from a rescue group or offers to show you adult min pins that need homes. The BEST breeders want what is best for the dogs they are placing and will discuss all options with you before a finale choice is made. 10) Your breeder Must provide you with a contract or condition of sale or adoption. Feel free to ask for this well in advance to read over carefully before your finale choice is made. A breeder should encourage you to take all the time that you need and Never, Ever, pressure you into deciding or make you feel rushed in any way. Your breeder should answer any questions you have about the contract in a friendly way and encourage you to ask more questions. Never sign any contracts until you are 100% sure and understand all the contents completely. Within the contract or condition of sale a SPAY or NEUTERING requirement will be included. This is NON-NEGOTIABLE if you are working with a reputable breeder. All pet dogs must be sold on an agreement that ensures the breeder that the pup will be spayed or neutered. Don't be surprised if your Breeder informs you that your AKC papers will not be delivered to you until the breeder has proof from your vet that this agreement has been met. To round all of this up you want to be sure you are working with a breeder that is producing Miniature Pinschers to preserve the best qualities not breeding to supply a market. Reputable breeders will produce a litter of puppies so they can replace a show-dog of their own, then find wonderful homes for the remaining litter. Some of these puppies will be placed in show homes, some in pet homes but all the puppies receive the same wonderful, loving care and well documented medical attention. Some breeders may request that you sign a waiting list for many will only breed to produce a show puppy for themselves only after approved pet homes are already lined up for the remaining puppies. A reputable breeder is striving and dedicating their time and effort to producing the best of the breed. Money is not the issue. Your breeder has spent many years being a “student” of the breed and continues learning from others that share their passion, often speaking of mentors that they have learned from. If your breeder is a serious breeder, dedicated to the improvement of the breed and Reputable by all standards they must be showing and competing with their dogs and will be proud to show you their accomplishments from the rings. Ask to see the show records or photos of the parents of your pup as well as a pedigree. By learning all you can about Miniature Pinschers before you start looking for a breeder you wont fall victim to an un-ethical breeder that will feed you any line at all to get you to write a check. You have to protect yourself for no one else is going to do that for you. You need to avoid any “breeder” that clearly shows a lack of knowledge about the breed. You must be armed with that knowledge. You want to know what genetic defects that can afflict Min Pins and you must only work with a breeder that is educated in these defects and will willingly show you proof their dogs have been tested and proven sound. Avoid any “breeders” that do not test their dogs for genetic defects or appear uneducated in the area of genetics or say that the breed in general suffers from no genetic defects. You want to avoid any “breeder” that will not allow you to observe all of the puppies and adults or let you view where the dogs/puppies are kept. If they won’t show you, they have something to hide. Keep in mind however that many reputable breeders will not allow anyone to see puppies that are extremely young, but all puppies that are in the litter you are choosing from should be readily available to view. Under NO circumstances should you work with a breeder that offers to bring a puppy to you to see or offers to meet you someplace with some puppies. There is a reason they don’t want you on their property, deplorable, unhealthy living conditions and sick dogs is usually the reason. You want to avoid any breeder that has several different breeds of dogs, appear to breed dogs as an income, Avoid breeders that don’t ask questions from you or act as though they don’t want to answer questions or refuse to answer questions. 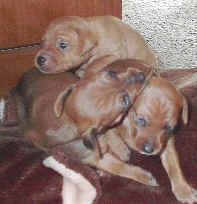 Avoid breeders that cannot or will not show to you and discuss the pedigree of the puppies. Walk away from any breeder that seems to be in a hurry to close the deal or makes you feel rushed to make a decision. Avoid all “breeders” that do not ask you to sign a contract, condition of sales or adoption agreement or do not demand a spay/neuter agreement. By now you have heard reference to Pet Min Pins and Show Min Pins and may be wondering what the difference is and if Pet Quality means there is something wrong with the puppy. As stated earlier there are size requirements for the breed as well as other requirements before a puppy can be considered a show potential. Only the trained eye of the most experienced breeder can determine the difference when it is time to begin placing the puppies in homes. Besides determining the grown size of the min pin other factors are looked at. Does the puppy show the desired Hackney Gait for AKC conformation competition? Does the puppy have the breeds required bite in the teeth? Is the puppy proportionally correct to enter competition? This and many other things determine if the puppies will end up in a Show home to carry on with a show career or in a Pet home. Those puppies that are sold into pet homes are just as healthy and received the same loving care as the littermates going on to Show homes. The only difference is there is something about the puppy that makes the breeder believe this is not what the judges will want to see in the show rings and has minor faults that would not make them appropriate to breed. It could be the puppy may not grow to the minimum height required by the breed standard. Maybe he is showing that he will grow slightly larger than the breed standard. These are not factors that would keep this puppy from being a loving member of your home; these are only factors that may fault the puppy in the show ring. A Pet Quality min pin, although wont do well in the show ring for conformation will make excellent house pets and can do quite well in other events. Perhaps you and your new min pin can enjoy a sport together such as agility, obedience, or even Fly-Ball. As a puppy buyer you will see in most cases the price of a Pet Quality min pin is slightly lower than that of a Show Quality min pin. Pet vs. Show is the only time you should see a difference in price. At no time expect to pay more for a min pin because of a rare color or size.